4.5 x 3.3 x 3.9 in. The Nikon Coolpix P90 couples a 12.1 effective megapixel image sensor with an extremely powerful Nikkor-branded 24x optical zoom lens that offers 35mm-equivalent focal lengths from a very useful 26mm wide angle to a whopping 624mm telephoto. Maximum aperture varies from f/2.8 to f/5.0 across the zoom range. Not only does the Nikon P90 offer true mechanical image stabilization - an absolute must given the strength of the zoom lens - but it also has the ability to vary its sensitivity automatically from a minimum of ISO 64 to a maximum of ISO 6,400 equivalent -- so it should certainly be able to freeze camera shake and subject motion. The Nikon P90 is capable of focusing to 1.7 feet (50 centimeters) ordinarily, and as close as 0.4 inches (one centimeter) in macro mode. 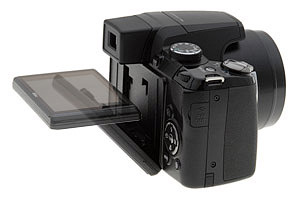 Coolpix P90 images can be framed and reviewed on the camera's 3.0-inch, 230,000 dot vari-angle LCD monitor. The LCD can tilt as much as 90 degrees upward or 45 degrees downward, and comes with an anti-reflection coating. As you'd expect for a long zoom bridge camera there's no true optical viewfinder, but the Nikon P90 features a fairly high-resolution (230,000 dots), 0.24-inch electronic viewfinder. Images are stored on Secure Digital cards, including the newer Secure Digital High Capacity (SDHC) types, or in a reasonably generous 47MB of built-in memory. Power comes courtesy of a proprietary EN-EL5 Lithium Ion rechargeable battery that's rated as good for 200 shots to CIPA testing standards, and is included in the product bundle. Other Coolpix P90 features include full PASM exposure modes, 15 scene modes, a Sports Continuous mode capable of capturing up to 45 2-megapixel frames at 15 frames-per-second, and Nikon's Smart Portrait System comprising of in-camera Red-Eye Fix, Face Priority AF, Smile Mode, Blink Warning and D-Lighting. The Nikon Coolpix P90 shipped from March 2009, with pricing of US$400 or lower. As I observed in earlier Long-zoom reviews, this class of camera is a different species, breeding the smarts built into smaller digicams with an optical brawn not usually enjoyed in a dSLR. But the species has suffered from shutter lag while autofocusing at long telephoto settings, awkward body shapes that make them difficult to handle, sometimes mediocre build quality, and the complexity of relying on menu systems instead of buttons. The challenges, however, have led to a variety of solutions. The class includes cameras with either AA or lithium-ion batteries, and large fixed or articulated LCDs. By necessity, they all have electronic viewfinders but they also include full PASM shooting modes. They are also a bit more demanding than an ultracompact. The more you know about aperture, shutter speed, and ISO, the better your results will be. Shooting in Green Auto mode is not the way to get the best results from this class of camera. Look and Feel. Like other long zooms that rely on compact lithium-ion batteries for power, the Nikon P90 is lighter than its bulk suggests. In some cases that's almost too light, but I thought the Nikon P90 had enough heft to resist camera shake when its Shutter button was pressed. Also like other long zooms, the large grip helps enormously with that. You can get your fingers comfortably around it and the ledge the grip forms also makes a convenient carrying handle if you opt for a wrist strap over the included shoulder strap. The Nikon P90 won't fit in your pants pocket or shirt pocket but there are jacket pockets large enough for it. A better bet is a small camera case with a shoulder strap or a purse for transport. For actual use you'll want it swinging from your shoulder or wrist, ready for action at any moment. Of all the long zooms I've reviewed this year, the Nikon P90 struck me as the most attractive. It looks good, with nothing cheap about it. The various black textures ranging from matte to piano black all seemed to have a purpose, as did the chrome accents on the Shutter button and Zoom control. The Nikon P90 is a handsome camera. Startup was relatively quick too. Considering that the Nikon P90's lens does have to telescope out, that was impressive. I didn't feel like I had to leave the power on to wake the camera for my next shot. It seemed to start up as fast as it wakes up. The lens cap is nicely designed, too. It can be tethered to the camera and uses two spring-loaded buttons on the side to release from the barrel. Like the camera, it isn't a cheap solution but a very well designed one. Controls. More than most long zooms, the Nikon P90 relies on its well-designed menu system rather than dedicated buttons to configure the camera. There are, in fact, so few controls on the Nikon P90 that the Quick Start Guide needs just a diagram of the back of the camera to show them all. On the top front of the grip the Shutter button is just where you'd expect to find it, surrounded by the Zoom control. The Zoom ring was one of the real disappointments on the Nikon P90. There is simply no way to zoom slowly or in small steps. The zoom jumps at the slightest nudge, making it hard to compose your shots carefully. Right behind those two essential controls is the chrome Power button with a small green LED in the middle of it. It's recessed but we didn't have much trouble using it. The LED was a little slow to light when using the Playback button on the back panel to power the Nikon P90 on without extending the lens, but that's our only complaint. To the left on the top panel is the Mode dial. It extends slightly over the beveled back edge within easy reach so you can twist it to another setting with just your thumb. There is a button to popup the flash on the left side of the flash. But there are no controls on the front of the Nikon P90. There is an autofocus assist/self-timer lamp between the lens and the grip, though. And the microphone is just next to that. The right side has the AV/USB port behind a rubber cover and the left side has the speaker. The back panel is dominated by the 3.0-inch, 230K pixel LCD. That's a big LCD for any camera and represents high resolution for a digicam if not a dSLR, but it's also an articulated LCD. The articulation allows you to swing the Nikon P90's LCD up 90 degrees so it's perpendicular to the camera, allowing you to put the camera on the ground and still see what's going on. It also allows you to swing it down 45 degrees to the camera, so you can hold it directly over your head in a crowd. Like the Sony HX1's LCD, you can't swing it sideways, but a funny thing about that. The cameras that do have LCDs that swing sideways, like the Canon SX1, were so awkward that I ended up just closing them in the traditional position on the back. And the two really important positions an articulated LCD provide are low and high camera positions. So I articulated this LCD more than any other. 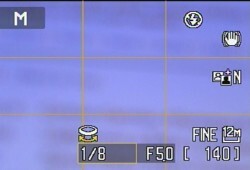 The toggle button for EVF/LCD display is to the left of the EVF. On the left side of the Nikon P90's EVF itself is the diopter adjustment control. The EVF is hard rubber, not plastic. I would have preferred soft rubber so eyeglass coatings would not be jeopardized, but I didn't have any trouble with the hard rubber. To the right of the EVF is the Display button that cycles through the monitor display options. At the far right edge of the top panel is a Command Dial, one of our favorite controls, borrowed from dSLRs. 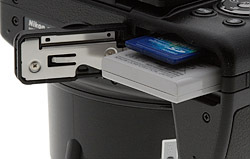 The remaining controls are located to the right of the Nikon P90's LCD. The Multi Selector with an OK button in the center is surrounded by three smaller buttons. On top to the left is the Playback button, which also turns the camera on with out extending the lens. Below the Multi Selector to the left is the Menu button to access the menu system and to the right the Delete button. The four arrow buttons on the Multi Selector do double duty in Record mode. The Up arrow cycles through the Flash modes (Auto, Auto with red-eye reduction, Off, Fill flash, Slow sync, and Rear-curtain sync). The Right arrow handles EV Compensation. 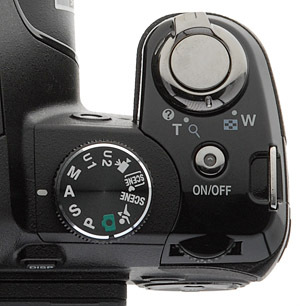 The Down arrow displays the Focus modes (Auto, Macro, Infinity, Manual). And the Left arrow cycles through the Shutter Release modes (10- and 2-second self timers, Smile timer, and Blink Proof). Being able to quickly set a long zoom to focus at infinity so it won't waste time trying to autofocus on a distant object at long telephoto focal lengths is a big advantage. Some long zooms hide this essential command, but the Nikon P90 puts it right at your fingertips. Scale 1:1. Compact, lightweight. Just like the P90. And Macro mode indicates focus range by changing the flower macro icon in the display from white to green. That's very helpful because, unlike some cameras, the Nikon P90 can shoot macro at focal lengths other than wide-angle. The Smile timer is an interesting option to think about whenever you might be inclined to use the usual self-timer options for a group shot. Pressing the Shutter button fully will delay the shutter at least five seconds before Nikon P90 looks for a smiling face. If it finds one, it fires the shutter. Blink Proof works like the Smile timer but takes two shots in case someone blinks, then it compares the two shots and saves the one without the blinking subject. These may seem like small things, but it's encouraging to see some digicam advances appearing in more serious cameras. Sony leads the way here with not only similar facial recognition tricks but its Sweep Panorama and Handheld Twilight modes. Some companies seem a little reluctant to include features like these but once you've used them, you miss them. One thing we did miss on the Nikon P90 was a hot shoe like the Canon SX1 or the Kodak Z980. If you're going to use flash at all, getting it off the camera makes a world of difference. A long zoom's flash, perhaps, is least likely to get any action. And you can always dial down the popup flash power to fire a slave. So this isn't critical, just inconvenient. Lens. The 24x zoom on the Nikon P90 is suspiciously similar to the 24x zooms on the Kodak Z980 and Pentax X70. And it shares the same specs. 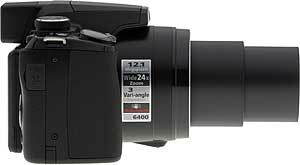 They start at an unusually wide 26mm in 35mm equivalent focal lengths, extending to 624mm. That wide-angle start does not penalize you much if you can get to 624mm, especially compared to 20x ultrazooms that start a bit less wide and reach a bit shorter. Maximum aperture at wide-angle is f/2.8 and at telephoto f/5.0. At any focal length, the minimum aperture is f/8.0. There are 14 elements in 11 groups with four aspherical elements. But unlike Kodak and Pentax, Nikon claims the P90 lens is Nikkor ED glass (ED stands for Extra-low Dispersion, a desirable trait in optical glass). Image stabilization, essential for low-light and telephoto shooting, is provided by a sensor-shift mechanism. There are no lens threads for filters on the lens, a missed opportunity. It would be marvelous to screw a circular polarizer on this to shoot landscapes. Our lab tests found strong geometric distortion at wide-angle, but the optional built-in distortion control helps correct that. There was less than a pixel of distortion at telephoto, however. Moderate to moderately high levels of chromatic aberration were observed, more noticeably at telephoto. Digital telephoto magnified some dramatic chromatic aberration that appears even in the center. Corners were blurred at both wide-angle and telephoto but did not extend far into the frame. This is all rather typical of the compromises one expects in a long zoom, particularly in one with this extended a range. 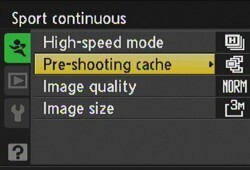 To Nikon's credit, they've addressed some of the weaknesses (like distortion) in post-processing. Even more to its credit, the company made that correction optional. Menu System. Nikon relies heavily on the menu system to set up the camera. Fortunately, it's a well-organized system that can handle the job. The Multi Selector's arrow buttons provide access to the settings you're most likely to change from shot to shot. But if you can't find the setting there, just press the Menu button. A vertically tabbed interface appears. The top tab indicates the Shooting mode, the second tab shows the Playback menu and the third shows the Setup menu. Shooting mode options vary depending on the active mode, but Program, for example, offers Image quality, Image size, Optimize image, White balance, ISO sensitivity, Metering, Continuous, Auto bracketing, AF area mode, Autofocus mode, Flash exposure compensation, Noise reduction, Distortion control, Active D-Lighting, Save user settings, and Reset user settings. Under Image size, for example, you'll find a wide array of aspect ratios in addition to image sizes. At 4:3, there are 12-Mp, 8-Mp, 5-Mp, 3-Mp, 1-Mp, PC and TV (VGA) options. 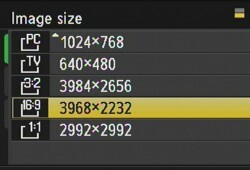 There are also 3:2, 16:9 and 1:1 options at the highest possible resolution. And ISO sensitivity has an expansive set of options. The manual settings from 60 to 6,400 along with Auto. But the Nikon P90 adds High ISO sensitivity auto and Fixed range auto (which offers 64-100, 64-200, and 64-400 ranges). Active D-Lighting is a marvelous advantage, effectively extending the dynamic range of high contrast shots so highlights are not blown out and shadow detail not dropped out. Strangely, though, the Nikon P90's Active D-Lighting shots wash out the image's color at Normal and High settings, something we haven't seen so dramatically with other Nikons. Some of these settings cancel others. Setting a high ISO, for example, will cancel D-Lighting. And the P90 won't tell you. A careful reading of the manual will highlight these conflicts, but it's worth getting into the habit of checking important settings when you change something. Having just two places to look for a command is a breath of fresh air. Three places seems to be the rule: buttons, a function menu and a system menu. And while you can get used to that hierarchy, you don't have to get used to the button, system menu scheme. Modes. The Nikon P90 doesn't offer an intelligent Auto mode that identifies which Scene mode to set but it does offer everything else. Intelligent Auto tends to slow the camera down because it takes a few cycles to figure out what it's looking at. That brings back memories of shutter lag. So, while it's useful for beginners who may be puzzled about when to set macro and when landscape, you can live happily ever after without it. Beginners may feel obliged to use Green mode Auto, which is like holding onto the edge of the pool. Every pool -- or camera -- has one and you won't drown. But it isn't much fun, either. In green zone, the Nikon P90's Menu button just lets you play with Image size and Image quality, nothing else. Instead, try the shallow end with Programmed Auto. That opens up a lot of options you don't have to use, but can experiment with. Like ISO sensitivity, one of the three keys to exposure. Or Active D-Lighting, one of the most important features you can enable on the Nikon P90. And the P90's Programmed Auto actually goes through your shutter/aperture combination options using the convenient Command dial. 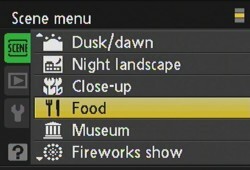 Some P modes just enable more menu settings but don't let you touch the shutter/aperture combination. There's no survey to support this, but I suspect Aperture Priority mode is the mode setting you'll find used most by more advanced photographers. That's because it dramatically changes the depth of field from a very shallow one at wide open apertures to a quite deep one at closed down ones. The Nikon P90 opens up to a fast f/2.8 and closes down to f/8.0 at wide-angle. At telephoto, you start at f/5.0 and get to f/8.0 with no more effort than spinning the Command dial. Very well done. Shutter Priority, famous for freezing or blurring motion like waterfalls, works the same way, using the Command dial to select the shutter speed you prefer. And for those times when you want to set both the aperture and shutter speed yourself, Manual mode is just a click away on the Mode dial. To select between shutter speed and aperture, you just press the Nikon P90's EV button on the Multi Selector then make your selection with the Command dial. It's more complicated on many other cameras, so forgive my enthusiasm. Nikon does provide a wide selection of Scene modes for situations that profit from making many little changes to the camera settings. As shortcuts they're pretty handy. They include Portrait, Night Portrait, Sports, Landscape, Party, Beach/Snow, Sunset, Dusk/Dawn, Night Landscape, Museum, Fireworks Show, Close Up, Copy, Back Light, Panorama Assist, and Food. Panorama Assist lets you set a direction to shoot in and shows a ghosted part of the last image on the side of the frame opposite that direction to help you align subsequent shots. Press OK to stop shooting. But the Nikon P90 leaves the image stitching for your computer to do with the included Panorama Maker software. Sports Continuous mode cranks the ISO up to 640 and beyond while using a smaller 3-Mp image size to buffer up to 10 images when you half-press the Shutter button and up to 35 images when you fully depress it. The rate of capture varies according to the mode you select among Continuous L (4 fps), Continuous M (6 fps), Continuous H (11 fps), and Continuous H 16:9 (15 fps). Movie mode is restricted to standard definition. That's 640 x 480 at 30 or 15 frames per second with an option for 320 x 240 at 15 fps. You can also capture a Time Lapse movie at 640 x 480 and various intervals (30 seconds, 1/5/10/30/60 minutes) for playback at 30 fps. And you can shoot Sepia or Black and White at 320 x 240 at 15 fps. In Movie mode you can set the lens using optical zoom but once you start recording, you are limited to 2x digital zoom (except when shooting Time Lapse movies). Digital zoom is not available before shooting and only zooms in, not out. 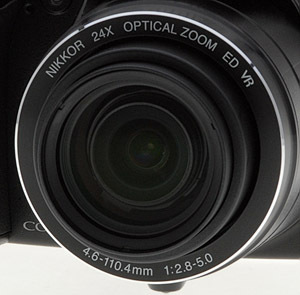 While optical zoom is jerky, digital zoom is smooth and functions well in this capacity. Raw Mode. Well, there isn't one on the Nikon P90. That may be a blessing in disguise, however. 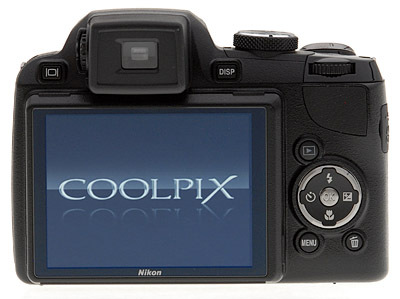 The last Coolpix with a Raw mode introduced yet another unsupported image format. But if you're upset about this, I'll tell you an interesting story that might make you rethink the whole thing. Bob Krist, the photographer featured with Joe McNally on Nikon's popular DVD tutorial on flash photography, recently confessed on his blog, "I shoot JPEG." Of course, as he quickly added, he always shoots Raw, too. But he finds that shooting Raw+JPEG Fine, he ends up using the JPEG image "about 80 percent of the time." And his clients are happy with the files. The trick, he suggests, is paying attention to the image settings. Using Active D-Lighting to extend the dynamic range, adjust for lens distortion, use the Optimize Image option to set Vivid, Neutral or Portrait ("read 'Velvia, Provia, or Asita' for you old 'transparency types'," he wrote) where appropriate and let the camera do your Raw processing for you. Storage & Battery. There is about 47MB of internal memory available but it's best thought of as an emergency gas tank. JPEGs tend to run as large as 5.3MB on disk, so you won't fit many in internal memory. The battery compartment accessed from the bottom of the camera includes an SD slot for primary storage. These days, 2GB to 4GB is a good trade-off between cost and capacity. And you'll appreciate the larger capacities if you shoot movies with the Nikon P90. The Nikon P90 is powered by a compact EN-EL5 lithium-ion battery rated at 3.7 volts and 1100 mAh. Using the rather taxing CIPA testing standards, Nikon estimates a fully charged battery will manage 200 shots, a little lower than average. The side of the camera adjacent to the battery compartment has a small rubber port to permit a dummy battery to cable to the optional EH-62A AC Adapter. Shooting. There's no fun quite like shooting with a 24x zoom. And when the camera behind it is as well designed as the P90 and as much camera as the Nikon P90, there's very little frustration to spoil the fun. Zoom Range. 26mm to 624mm to 4x digital zoom. It doesn't hurt that it's fairly compact and lightweight, either. While it's really too big to fit in a shirt or pants pocket, it fits in just about anything else. So you can sneak it along on just about any outing. My first foray was just around the neighborhood, capturing every detail of a spider web in a geranium at a moderate telephoto focal length that nicely blurred the background. This was a snapshot, captured without any forethought, really. Point (compose) and shoot (expose). Granted, the highlights are overexposed in this shot, mostly due to the darker background. Next we hopped on a mountain bike, locked the Nikon P90 to a Cotton Carrier harness (https://www.imaging-resource.com/ACCS/CTN/CTN.HTM) and rode up Twin Peaks to take the zoom series and try out the digital zoom. In the Cotton Carrier, the camera is not only out of the way for mountain biking, but secure. The two are a wonderful combination. While I did use digital zoom from the overlook area, I found the lens has such range that I really didn't have to use it to frame shots of downtown and the Ferry Building. At the equivalent of 624mm, the shot of the Ferry Building clearly shows the time. I found a couple of annoyances when shooting with the Nikon P90. One option setting often canceled another and the zoom was difficult to control. The Custom user settings are important on the Nikon P90 because some combinations of options you set with the Menu system are not possible. High ISO, as I mentioned, cancels Active D-Lighting. So you might want a user setting that always enables D-Lighting. Fall Colors. ISO 64. Note the slight yellow cast to all greenery. The optical zoom was fast but nearly impossible to precisely control, which is a shame because speed isn't nearly as important as precision with such a long range. In our lab shots, some of my images, and in Senior Editor Shawn Barnett's images, we noticed a tendency for the Nikon P90 to render daylight shots yellow when set to Auto white balance. Skin tones especially swung toward yellow when we applied any positive exposure compensation, and shots of green foliage have a high yellow cast even without exposure compensation. We got somewhat better results switching to Daylight white balance, but often color seemed flat, and skin tones lost some of their life at that setting. See the Exposure tab under Extremes: Sunlit and low light tests. Indoors, images had a red cast with tungsten lighting, while daylight coming in a window would produce very yellow shots again. Our Macro test shot of the dollar bill is likewise quite yellow, despite our use of 5500K lights, the same lights we use for all other cameras. I took the Nikon P90 into the Sierras to capture a little fall color. The EXPEED processor did a nice job with the color and contrast in the mountains. I also found the various aspect ratios a real boon. The Boat House just had to be 1:1 and Bucks Lake cried out for 16:9. That's something you can't do with a dSLR. Santa. ISO 6,400 by light of a 60 watt bulb. Again, Auto white balance renders his beard a little yellow, but his larger detail prints fairly well at 4x6 and even 5x7. The shots in the gallery from that trip are all at EV 0.0, but there were a few taken at twilight that required a bump in EV. You can also see that Programmed Auto kept the ISO under 200, preferring ISO 64 for the most part. I did take a few high ISO shots. The keyboard and Santa shots are also both macro shots. The keyboard at ISO 464 shows good color and detail if noticeable noise. And the ISO 6,400 shot of Santa is really one of those things you would not think of taking a photo of because of the darkness. Yet there it is. I did miss the handheld twilight mode of a few other recent cameras, but unlike ISO 6,400, that won't work for moving subjects. So while it was fun to take the camera out on one ride or hike or another, the real pleasure was the lasting one of looking at the images I'd captured. The LCD really couldn't show me the detail I'd captured or the color, for that matter, that my computer monitor later revealed. Lens scatter. Light hitting the lens caused this shot to wash out quite a bit, which is why you usually get a lens hood with long zoom cameras like the Nikon P90. It's important to point out that though I enjoyed using the Nikon Coolpix P90, and was mostly pleased with the images from my outings, we still have the problem of the poor performance in the Auto white balance mode that tends to make regular daylight into very yellow light, somewhat at random, and the overall tendency of images carry an odd yellow glow, especially in the shadows. Boost the EV compensation and this effect gets worse. Looking at the histograms in these modes, Red seems to oversaturate in the highlights, while Blue has a large spike in the shadows, which could create this yellow shift. We recommend that for best results with the Nikon P90 you change your white balance settings as the light changes, especially in daylight or tungsten lighting. Highlights are also frequently blown out, and because the Nikon P90 doesn't come with a lens hood, shots made into the sun frequently have very low contrast, thanks to the light flooding the lens. The final problem with the Nikon P90 is its tendency to mush out detail at all ISO settings, including 64 and 100. 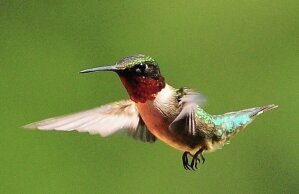 Other cameras in this category had the same problem, including the Canon SX10 IS, but not to the same degree as this. The Nikon P90's performance in our indoor test shots under tungsten lighting showed very limited detail, thanks to the heavy-handed noise suppression. Adding to our confusion over the yellow cast we found in too many images, all of our flash test shots have a yellow-amber cast to them. Given that flash shots are usually blue, it's very odd that they should appear so warm; again, the Auto white balance is making the wrong choice for the type of light it sees, even when it's the camera that's creating it. Printed results. All of the above shows up in the printed results as well, but the Nikon P90 does well enough here that it's not a total loss. Still, when you consider that this is a 12-megapixel camera, the 13x19-inch prints should be better, but the noise suppression left a mark on the images that was noticeable at this size. But 11x14-inch images look pretty good, even up to ISO 200. ISO 400 shots are better at 8.5x11, and ISO 800 and 1,600 shots are good at 5x7. Surprisingly, ISO 3,200 shots are indeed usable at 4x6 if the subject fills the frame well enough. Summary. For most people the Nikon P90 will produce good enough output for common print sizes, despite the overaggressive noise suppression, but Auto white balance will often disappoint, and the lens could use a hood. There's no question that the Nikon P90 is fun to use, with a zoom that covers an amazing range and often produces images you'll enjoy, but the Auto white balance in particular makes it more difficult to commit to this 24x long zoom camera. Large capacity SD/SDHC memory card. These days, 4-8GB is a good trade-off between cost and capacity. Long zooms are making a comeback with new models from nearly every major manufacturer this year, some even breaking the 20x barrier. Kodak, Pentax, and Nikon have broken out with 24x lenses, Nikon's being the Coolpix P90. Its small, tight build feels good and high quality, with a good grip and simple controls. But its the lens, with its 26-624mm zoom range that really makes using the Nikon P90 so fun. We also liked the P90's automatic switching to Macro mode. Missing are an HD Movie mode, intelligent Scene recognition, Raw capture and some of the fancier exposure modes like handheld twilight and sweep panorama found on the Sony HX1. But the Nikon P90 also has some great features of its own, particularly the Sports Continuous Scene mode, which can capture shots at up to 15 frames per second at a reduced resolution, great for capturing action shots. Unfortunately, there are quite a few image quality problems with the Nikon P90. Noise suppression is overactive at even the lowest ISO settings, obliterating fine detail. Color, too, is very odd overall, and a poorly tuned Auto White balance makes images overwhelmingly yellow much of the time, even in daylight and flash shots, which is unusual. Active D-Lighting, which is normally a useful feature, saps color from the images. Images shot into the sunlight are often marred by lens flare, something that you'd normally address with a lens hood, but none is included, and it doesn't appear that one can be attached. Except for the noise suppression, these are issues that don't come up with the Sony HX1, Canon SX20 IS, or Panasonic FZ35, all of which are high on our list of long zoom cameras. While we enjoyed our time shooting with the Nikon Coolpix P90, we can't recommend it as strongly as we'd like. A more attentive enthusiast shooter might be inclined to work around some of the problems by setting white balance manually, but most consumers won't bother, and will be disappointed with the yellow images. Printed results for images that aren't marred by the yellow cast are good enough for anyone who doesn't enlarge more than 8x10 in size, though, so if you're looking for a really long zoom camera, the Nikon P90 isn't a bad choice. For better quality overall, though, check out the cameras linked above.